Pramukh Swami Maharaj, the spiritual guru and head of the Bochasanvasi Akshar Purushottam Sansthan of Swaminarayan sect, passed into the ages on August 13. 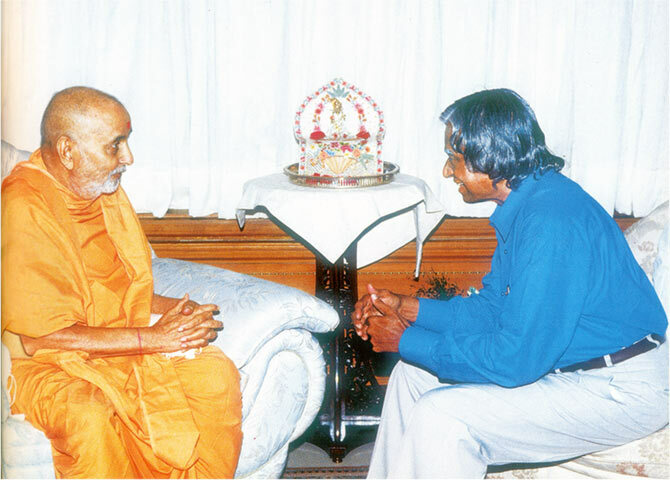 Among the many millions of people Pramukh Swami inspired was A P J Abdul Kalam, who recalled their encounters in Transcendence, the book published soon after the late President's death. I have vivid memories of my childhood in Rameswaram, but one memory particularly stands out, and comes to mind occasionally. As a ten-year-old boy, I recall seeing three contrasting personalities meet from time to time in our home: Pakshi Lakshmana Shastrigal, the Vedic scholar and head priest of the famous Rameswaram temple; Rev Father Bodal, who built the first church on Rameswaram Island; and my father, who was an imam in the mosque. These three would sit in our courtyard, each with a cup of tea; and they would discuss and find solutions to the various problems facing our community. Reflecting on this, I can see that my father and his religious counterparts in Rameswaram were expressing a long-standing cultural trait. India has shown a healthy propensity for integrating diverse ideas and reaching a consensus, for thousands of years. And I cannot help but feel that the example of those inter-religious meetings at my family home is most worthy of emulation. Because now, throughout the nation and the world, the need for such frank and genial dialogue among cultures, religions and civilizations is more urgent than ever. Starting with my father, Jainulabdeen, I have been blessed with some great teachers, who appeared at different stages of my life. My father taught me to view one's role in life as that of an instrument or vessel, through which one takes with one hand and gives with the other. "There is only one light, and you and I are holes in the lampshade," he would say. My father lived a simple life as it unfolded before him but never lost sight of the underlying divinity. Throughout my life, I have tried to emulate my father in this regard. My experiences of eight decades have validated the teaching I received from him. I do believe that all human beings carry divinity inside themselves, and that this can lift us out of confusion, misery, melancholy and failure, and indeed guide us when it is contacted. As a young engineer, I worked with Dr Brahma Prakash. He taught me how tolerance of others' views and opinions is essential in building teams and accomplishing tasks that are beyond the individuals' capacities. He taught me that life is a precious gift, but it comes with responsibility. With this gift, we are expected to use our talents to make the world a better place, to live an ethical and well-balanced life, and to prepare for the spiritual life, which is eternal. Dr Brahma Prakash changed the way I saw the world. 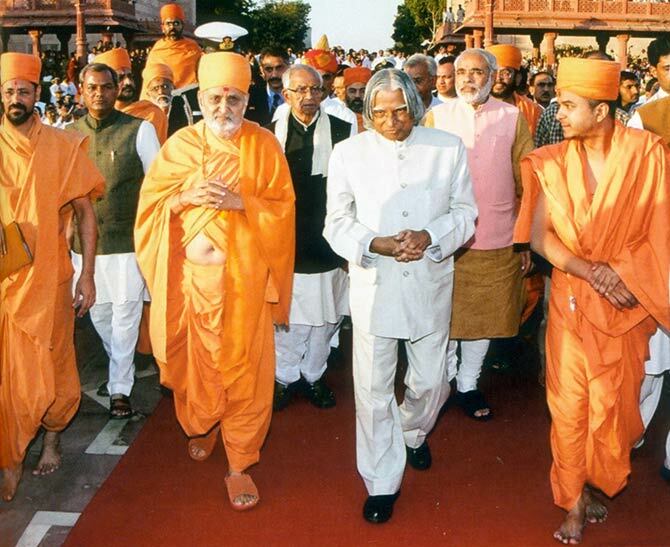 He once told me, "Kalam, if you see this world as mean and rude, it will interfere with your concentration. Negative thinking is similar to carrying twenty bags of luggage on a trip. This baggage will make your trip miserable, and progress will be slow." As a project director, I worked with Professor Satish Dhawan, who taught me that a good leader takes the responsibility for the failures of his team, but gives the credit of his success to his colleagues. His academic accomplishments were awesome. He had a Bachelor of Arts in mathematics and a Bachelor of Science in physics, followed by a Master of Arts in mathematics. These were augmented with a Bachelor of Engineering in mechanical engineering, a Master of Science in aerospace engineering. When I asked him the secret of his brilliance, he told me: "Academic brilliance is no different than the brilliance of a mirror. Once dust is removed, the mirror shines and the reflection is clear. We can remove impurities by living pure and ethical lives and serving humanity, and God will shine through us." Later, I met Jain muni Acharya Mahapragya, who made me realize the affirmation of a divine life upon earth and an immortal sense in mortal existence. He taught me that our consciousness is the birthplace of our ethics. He said, "We know something is right when our consciences are clear. Our consciences are our true friends." Together we wrote Family and Nation and articulated two steps to the process of listening to our conscience -- to become self-aware so that we can connect to our conscience, and to act on what our conscience says. I met Pramukh Swamiji, my ultimate teacher, unwittingly. Fate and my curiosity had drawn me to him. Earlier, as principal scientific advisor to the Government of India, I had visited Bhuj to review the rehabilitation work in the aftermath of the earthquake. 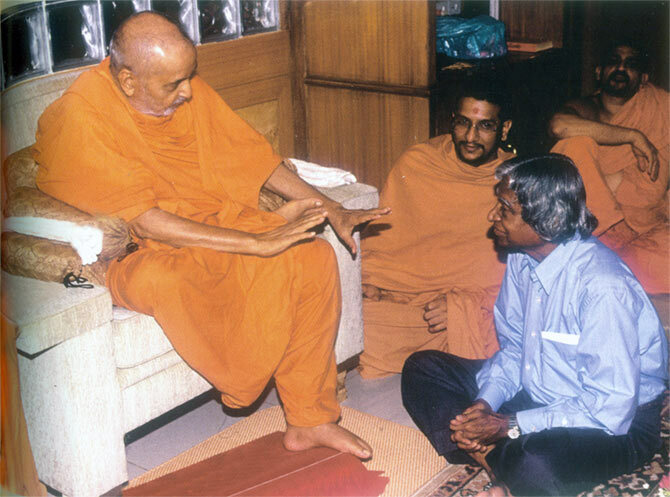 There, on 15 March 2001, I met Sadhu Brahmaviharidas, a disciple of Pramukh Swamiji. He asked me a startling question which elicited a spiritual response. He asked: "After the detonation of the first atomic bomb, Robert Oppenheimer remembered the Gita: 'Time I am the shatterer of the world.' What came to your mind after you detonated India's first atomic bomb?" I was puzzled by this question, and said, "The energy of God does not shatter, it unifies," to which he replied, "Our spiritual leader, Pramukh Swami Maharaj, is a great unifier. He has unified all our energies to regenerate and restore life from the rubble of damage." I was moved and expressed my desire to meet such a swami. What began as a chance introduction became a divine destiny. Over several years and multiple meetings with Pramukh Swamiji, I realized that a divine life can have no base unless we recognize the eternal spirit as the inhabitant of this bodily mansion, and integrate all of which the eternal spirit is comprised. That all those living on this planet Earth -- around me, away from me, in my country, in other countries; even other species and vegetation and minerals -- are all different forms of a great unity. At the most elementary level, all nature is one. Only one noble material weaves constantly different garbs. The nascent convergence of Nano-Bio-Info-Cogno technologies is testimony to this. How can we ensure that this convergence leads to human good and not harm; to the benefit of the marginalized and poor and not to merely an influential few? With these thoughts on my mind, I travelled to Sarangpur, Gujarat, on 11 March 2014 to see Pramukh Swamiji. This was our latest meeting. We met in a garden inhabited by peacocks, surrounded by beautiful flowers. In an emotionally and spiritually charged atmosphere, Swamiji held my hand for ten minutes. No words were spoken. We looked into each other's eyes in a profound communication of consciousness. It was a great spiritual experience. I have had a few spiritual experiences even earlier. On 30 September 2001, I survived a helicopter mishap. That night, I had a very vivid dream. I saw myself in a desert on a moonlit night, surrounded by miles of sand. Five great men, namely Emperor Ashoka, Mahatma Gandhi Albert Einstein, Abraham Lincoln and Caliph Umar, communicated a mission to me for igniting the minds of the young with hope. On 28 April 2007, in the cave on Philopappos Hill -- the place of imprisonment and self-sacrifice of the great soul Socrates -- I saw in my mind's eye a powerful streak of lighting. But at the garden in Sarangpur with Pramukh Swamiji, there was a difference. On the earlier two occasions, I felt that perhaps my own imagination was at play. This time, Pramukh Swamiji was holding my hand. I became oblivious to the people around us, and was drawn into a kind of timeless silence. I felt that his was the hand of transformation that could bring a change that the world needed today. In these moments, a world vision based on Mother Earth was intuitively communicated to me. Pramukh Swamiji is Gunatit Satpurush, a spiritual person. He has transcended the ephemeral and the modes of nature. I felt as if through Pramukh Swamiji a divine message was transferred to me about something endowed to mankind by God almighty, but forgotten by humanity. In a revelatory flash, I realized that the struggle between happiness and unhappiness that had so far been the story of human existence -- and the struggle between peace and war that had been the history of the human race -- must change. I heard in the silence of his grip on my hand, "Kalam, go and tell everyone that the power that would lead us to eternal victory amid these struggles is the power of good within us. Communicate to mankind the vision of a harmonious world. This vision would be greater than any other goal ever aspired to by humanity." A harmonious world may seem an impossibly utopian vision. But with the guidance of the Divine, and in acknowledging the unity of all creation -- and with the helping hand of such transcendent souls as Pramukh Swamiji -- the impossible may be achievable. And a harmonious world begins with a harmonious inner world -- an unavoidably spiritual quest. For us to ignite our spirituality, we need to look inward and transcend our egos. We need to recognize, connect with and integrate the eternal spirit within. There are four steps for this: Search in the right place, Remove the dust, Open your inner eye and See your destiny waiting for your effort to be realized. Accordingly, I have written this book in four parts. The book starts with my spiritual experiences in the presence of Pramukh Swamiji. The second part reflects on the social work undertaken by the Bochasanwasi Shri Akshar Purushottam Swaminarayan Sanstha (BAPS) under the stewardship of Pramukh Swamiji. The third part shows the way ahead for humanity, with a vision of the fusion of science and spirituality. The fourth part calls for creative leadership, which is essential for the realization of this vision. The spirit of inclusiveness of BAPS offers a seed to build a glorious crystal of a peaceful and prosperous world, where all civilizations coexist harmoniously and accommodate each other. Pramukh Swamiji has already made an example, by creating a reflective society living through its cultural heritage. He has taken the glory of India to Africa, Europe, America and the Far East in the form of magnificent Swaminarayan temples, strong fellowship of devotees and well-wishers that encompasses millions world wide. Let it now expand into public dealings -- transparent governance and ethical business -- based on truth. Driven by the convergence of Bio-Nano-Info-Eco-Cogno technologies, human beings will have unprecedented power. A vision is required to ensure that living conditions at the bottom of the social pyramid will improve across social, political and economic boundaries. When this book was almost complete, my elder brother A P J Muhammad Muthu Meera Lebbai Maracayer called me from Rameswaram one morning after fajr prayers. Such a call so early in the morning initially worried me, but I was relieved upon hearing his cheerful voice. He asked me, "Tell me, brother, what is the most important thing you are doing these days?" I had told him about this book. I expressed my doubt to him: Whether it is appropriate for me as a Muslim to write about the leader of another religion. I have much respect for my brother Maracayer's judgement. He is fourteen years my senior and had lived a very pious life, grounded in Islamic religion and service. He said, "Kalam, when Prophet Muhammad, sallallahu alayhi wa sallam, arrived in Medina, there were Jewish and Christian tribes living there. He entered into a treaty with them within a larger framework dealing with inter-Muslim relationships. One of the clauses laid down in the treaty required that each party hold counsel with the other. Mutual relations shall be founded on righteousness; sin is totally excluded." My brother concluded by asking me to go ahead with the book, and share with everyone details of the pious and virtuous life of Pramukh Swamiji. Thus, the book was finally completed. I dedicate this book to all the righteous people of the world wherever they are. The Swaminarayan temples and Akshardhams are indeed the sanctuaries of pious and virtuous living. They are abodes of peace and beacons of hope, rescuing people from the bottomless pit of self-indulgence, and, through service, reminding them of their true selves and allowing them to become wholesome human beings. An increasing number of people, particularly in the developed world, are finding freedom from superficial relationships, trivial communications and the constant noise that pervade the modern world, in the counsel and guidance of BAPS saints. May this divine presence increase! Excerpted from Transcendence, by A P J Abdul Kalam and Arun Tiwari, with the kind permission of publishers, Harper Element, an imprint of HarperCollins Publishers. You can buy your copy of Trancendence here. You can buy other books by A P J Abdul Kalam here. 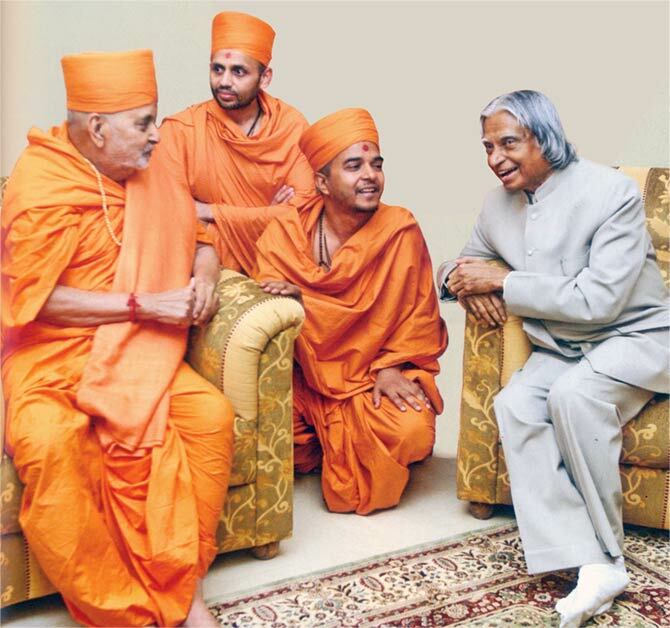 IMAGES: President A P J Abdul Kalam with Pramukh Swami Maharaj. Kind courtesy: Trancendence.